The local association, Amezray SMNID and the owners of the igherm have reached the final stage of drafting the library’s management plan. Once this management plan is signed by both the association, the igherm owners, and project manager, Cloe Medina Erickson, the final stage of construction can begin. This spring the drafting of the management plan for the library was given to Amezray SMNID, which is a local and legally registered Moroccan community association. Throughout the spring and summer, Youssef Oulcadi, the association president has been working with the community to draft a community-wide plan that will discuss all details of the library management including income, financial reporting, librarian job description, operating hours, and more. Oulcadi anticipates that the plan will be finished by September 2011 and signed by all responsible parties in October. Youssef Oulcadi, Basou Adi, Jim Miller, and Mustapha Qadery (from left to right). Additionally, in July the Moroccan American Commission for Cultural Exchange (MACECE) visited the project with their Fulbright-Hayes Summer Seminar group, which included 15 American academics and scholars representing their affiliated universities. The MACECE group visited the igherm and learned about all of the Atlas Cultural Foundation’s work in the region. Genevieve Chabot of the Global Midwife Education Foundation spent four weeks with me in Morocco this spring kicking off the program. After many lengthy meetings with officials from the Ministry of Culture, local village leaders, and the women who will be trained, the program has been expanded from a one-year to a five-year program. The goals of this expansion are to incorporate the Moroccan Ministry of Health and their medical professionals in the trainings to foster a relationship with the local women and to include a transfer of skills component to the program that will follow each woman back to their home villages and help them apply their new skills in a hands on manner. The five year Midwife Training Program is training 12 women selected by the local associations with the agreement of their families. Chabot will return to Morocco in October to initiate the first of the trainings which will include blood pressure training and time keeping training among other basic skills that will be needed in the more medical trainings. 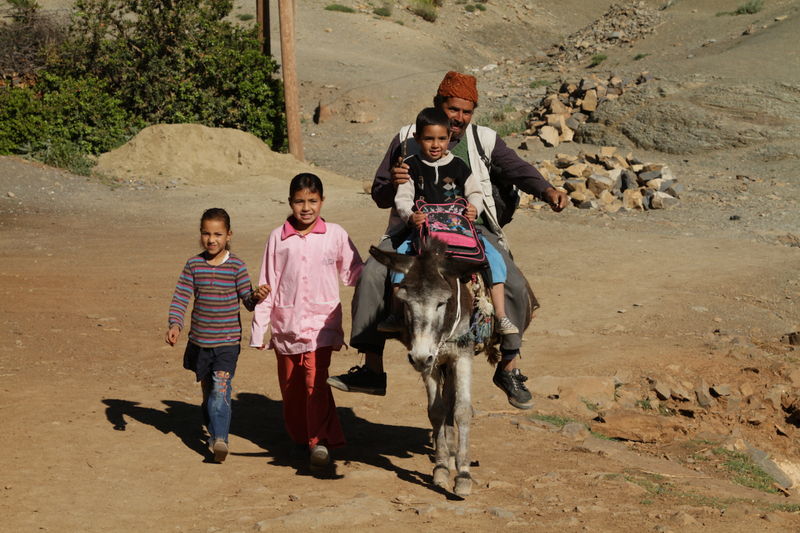 In these five years, we hope to be able to demonstrate a low-cost program that the Ministry of Health will be interested in implementing in other remote, road less, and nomadic regions of Morocco. Reduce maternal and infant (0-12 months of age) mortality by 50%. Increase utilization of the Zawiya Ahansal clinic and Azilal hospital for births and medical care by 100%. Decrease infectious diarrhea through increased toilet use and water sanitation. Provide education and supplies for hygienic home births if transportation to the local clinic or Azilal hospital is not possible. Improve nutrition for pregnant women and children. 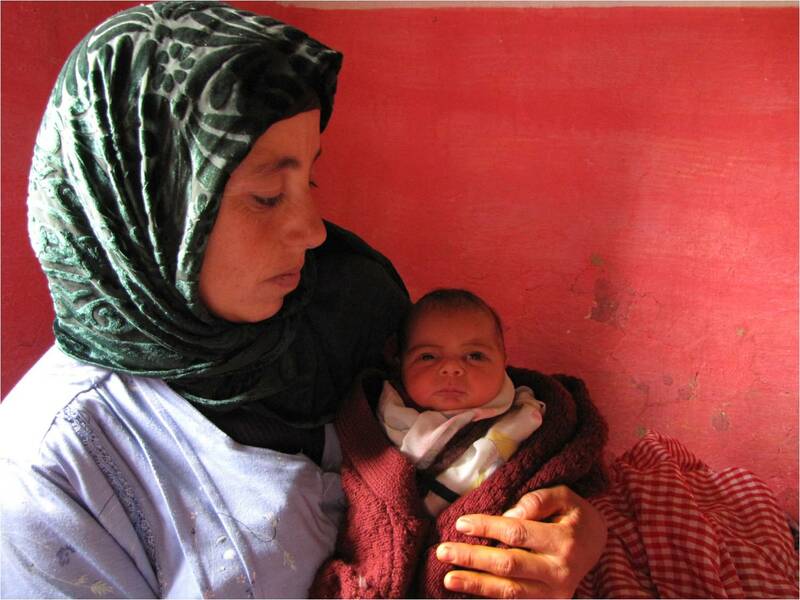 Educate women regarding newborn care and identifying sick newborns who need medical treatment. I arrived in Zawiya Ahansal, Morocco a few days ago to oversee the field work for the next three months. The first week or two in country is always busy with administration and paperwork. Yesterday we solidified an official partnership agreement between Atlas Cultural Foundation and the local association Amezray SMNID. 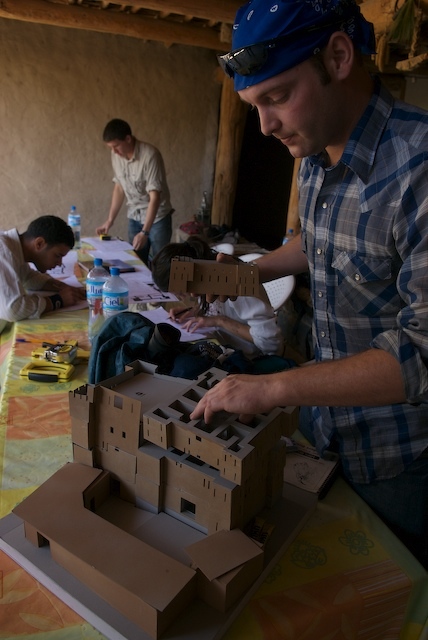 Atlas Cultural Foundation is an American NGO that was formed last winter to manage and house the philanthropic work of Erickson Creative Group in Morocco. ACF is a registered 501c(3) non-profit project under the umbrella of Adirondack Sustainable Communities, Inc. Amezray SMNID will act as the local representative of the people and will also be able to collaborate and communicate with our Moroccan Ministry partnerships in the absence of ACF staff. Today we signed an agreement with the owners of the Amezray Igherm to begin construction of the library and community room portion of the project. We also began discussion about the initial management of the library and training of young men and women to become the eventual librarians. We finished the restoration of the building in the Fall of 2010 and will now focus our efforts on the construction of the library. We hope to complete the construction this spring and finish the interior in Fall of 2011. 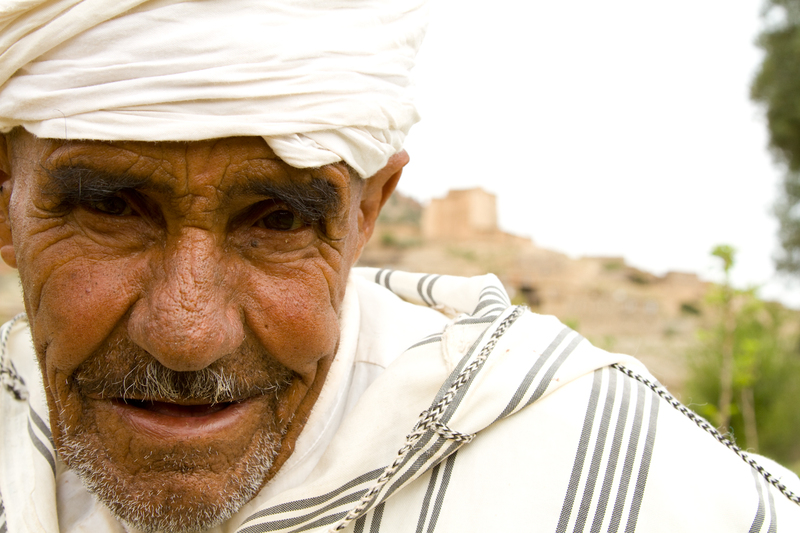 Youssef Jini, the gate keeper for the igherm, was very excited about starting the next phase of the project. “This project is for the next generation,” he said. “It is for our children and the future of Zawiya Ahansal.” In addition, this spring we plan to begin the restoration of a second igherm in the village of Aguddim. 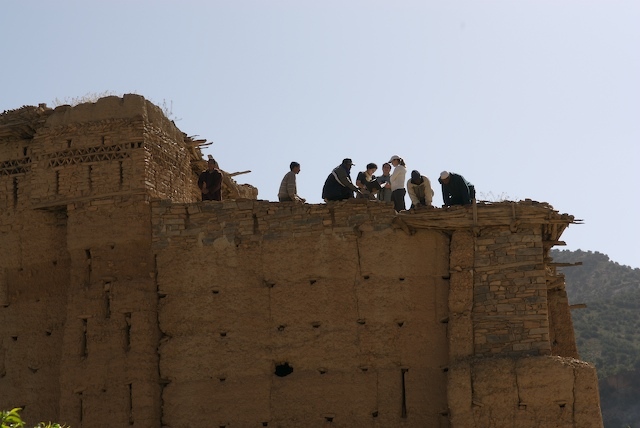 The Moroccan Ministry of Culture will be paying for the restoration of this building and will send a project contractor and architect to meet with me. ACF will act as the on-site manager of this restoration. We are continuing discussions with the locals about the best use for this building; some of the ideas are a preschool or women’s birthing center. Genevieve Chabot, a representative from the Global Midwife Education Foundation, will visit us in May. She will accompany Youssef Oulcadi, the president of Amezray SMNID, and myself on a trip to Rabat to visit the Moroccan Ministry of Health with the hopes of securing the necessary permissions to begin the Midwife Training Program. During this trip to Rabat we will also meet with officials at the Moroccan Ministry of Culture and Ministry of Education. All programs and projects are progressing well and the spring is shaping up to be fruitful. Moroccan Ministry of Culture partnership approval! I am very pleased to announce that the Moroccan Ministry of Culture has approved our partnership proposal. They have agreed to fund the restoration of a second igherm in the region (there are eight historic igherms). Work on this igherm will begin in April of 2011. The community is currently deciding on the best use for this igherm and is contemplating renovating it into a preschool or women’s birthing center. Either of these uses will compliment the library in the Amezray igherm. The partnership from the Ministry means that as an organization all of our fundraising dollars will go directly to the uses within these historic buildings and to the management and operation costs of the development projects. 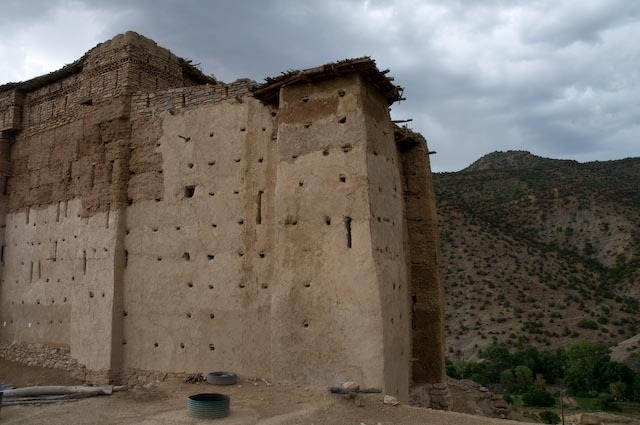 The actual restoration will be funded by the Moroccan government. Ahmed Amahdar, the Sheikh of Zawiya Ahansal. I just returned from nearly four months working in the field. It was an extremely successful trip on numerous levels. We finished the exterior renovation of the igherm including the martoub (stucco finish), new roofs and reconstruction of the six original decorative towers. The local association Amezray SMNID has provided the project with potable water and will be responsible for oversight of the library’s operations and finances. The French Association Les Amis de Amezray has agreed to sponsor and oversee the training of locals to become librarians. Montana State University graduate architecture student Jaron Mickolio completed the design for the computer rooms, reading room and book stacks. The Caid of Zawiya Ahansal will be donating all of the local government’s history books on the region, tribal records and family trees to be housed in the library. They want the library to be a place for researchers and professionals to come and study in addition to being for locals and school children. The library will serve over 10,000 local men, women and children. Igherm during construction with Mount Aroudane in the background. During my visit I attended numerous meetings focused on the future of Zawiya Ahansal with the local government and tribal leaders including the Sheikh, Caid, Moqaddam and Caliph. At the moment Zawiya is lucky because its leaders are very open-minded and eager to develop the region in a sustainable manner that respects their culture. They are so grateful for all that we are doing in the region that on more than one occasion I saw these grown government men cry – with real tears of happiness for our work and efforts in the region! Cloe Medina Erickson meets with local leaders. The Moroccan Ministry of Culture heard about the project and invited me to Beni Mellal, the provincial capital, to present our work. As a result of this presentation they have offered to partner with us and expand our work to include another project in the local village of Aguddim. This new project will begin in September and will include the restoration of a 300 year-old igherm into a professional residence. This igherm was originally a saint’s house and once renovated will provide visiting researchers, authors, and artists a historic yet modern place to live and work for extended periods of time. Saint's house, location of new professional residence. The saint's house will be returned to its original splendor. Photo: Ernest Gellner, Saints of the Atlas. In addition to talking with the government about restoration projects we also talked about the most pressing needs in the region in the areas of education, health, and economics. They have provided me with a list of their top five needs. 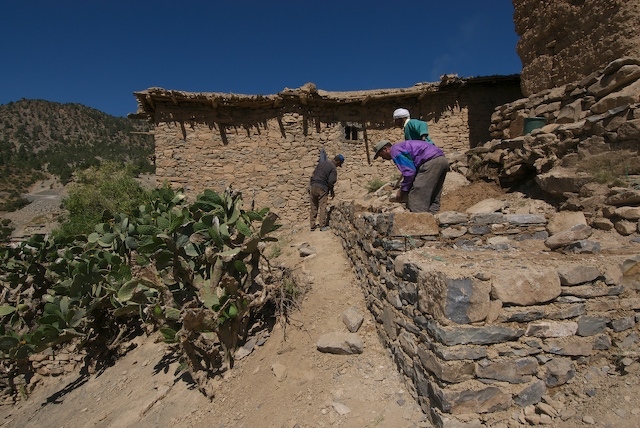 Among these is providing clean drinking water to five very small villages in the region, an ambulance, a snow plow (so the ambulance can get out in winter), trail work to Taghia, a boarding house for school girls and a garbage incinerator. With our new partnerships in Morocco we hope to expand our mission and slowly include projects that focus on both restoration and health, education and economics. What do you think is the highest priority in the region for our future projects? A local family that will benefit from the library. I will return to Morocco in September and we will begin construction on the library, break ground on the professional’s residence and begin discussions on our future goals. 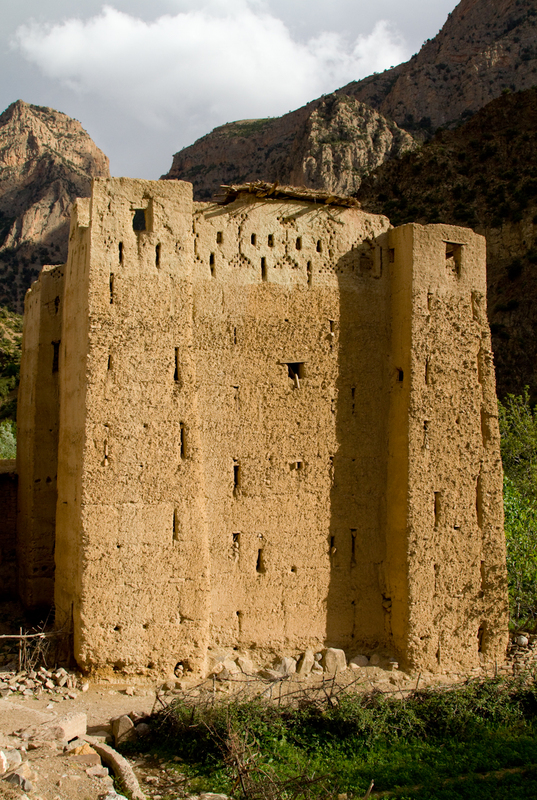 The harsh winter of Morocco’s Central High Atlas Mountains is waning and restoration of the igherm is now able to resume for the nest two and a half months. 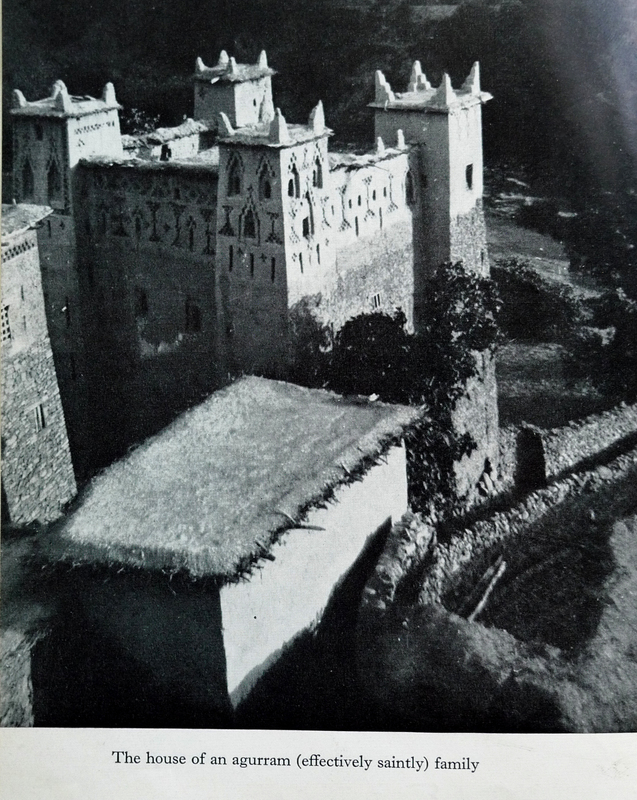 Our goals for this period include completing the martoub (exterior stucco finish), refurbishing the traditional wood and clay roofs and rebuilding the six decorative towers. One week ago, the local restoration crew began collecting soil for the martoub in preparation for my arrival on March 31. Mohammed Taiboosh, one of the restoration laborers and also a member of igherm’s proprietary tribe, Ait Bin Ahmed, has three sons that will benefit from the project. Historically, the majority of the residents of Zawiya Ahansal are illiterate, but Taiboosh has hope for his childrens’ generation and believes the igherm project will help boost their positions in society and future opportunities. 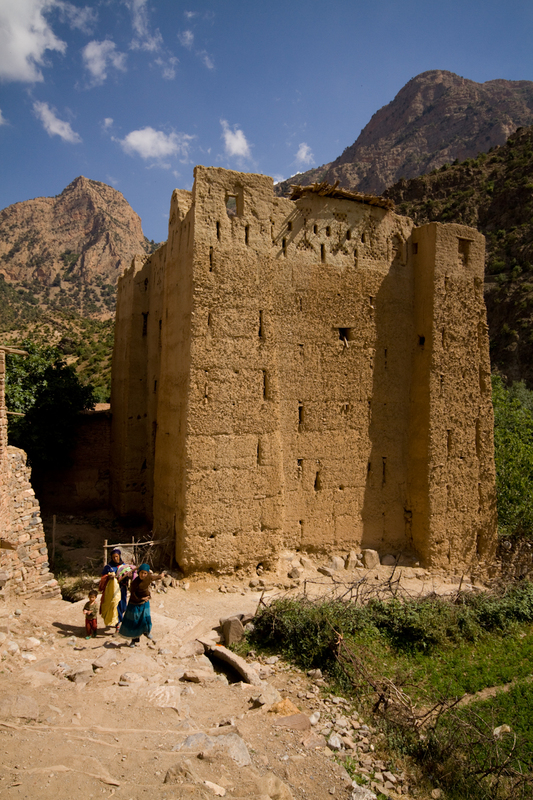 At the end of April l will lead a group of project donors on a ten-day excursion through Morocco. 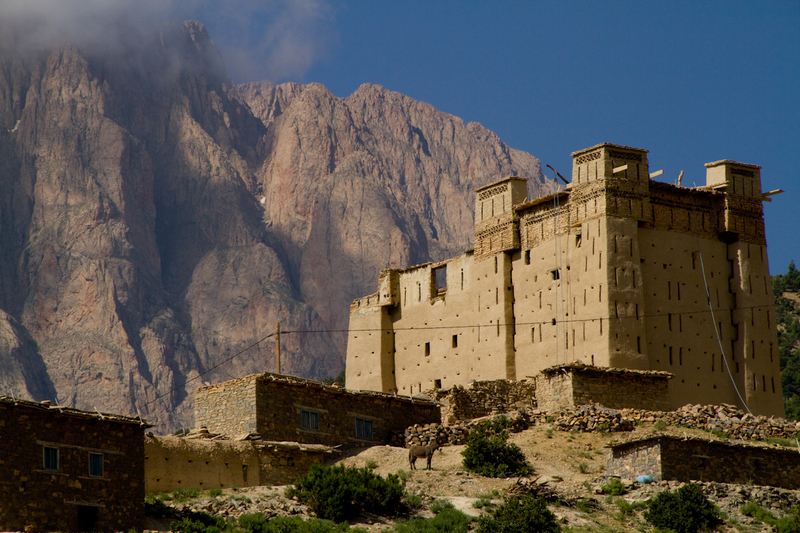 The trip is organized through Bella Treks LLC and will include a four-day visit to Zawiya Ahansal and the project site. The donors will meet with the people that will directly benefit from their generous donations. For the second year, the project has partnered with Montana State University and will bring a group of students to Morocco for five weeks in Morocco. The students will work with the community on the establishment and design of the library, books stacks, computer room and coffee shop. The Nobelity Project, Dell and 50×15 donate computers to library. Thanks to The Nobelity Project, Dell, and the 50×15 foundation for donating 13 computers to the library! Through the Nobelity Project, a certified 501(c)3 education and action non-profit, 8 OLPC’s and 4 laptops have been donated for use in the community room of the library. The computers will be used to teach locals, adults and children, about basic computer use through a series of training workshops. The Nobelity Project, founded by Turk Pipkin, is working towards a better future of all our children. One of our principal goals is to connect people all over the world with reliable information and innovative thinking on pressing global problems like global warming, the energy challenge, global health, economic disparity and development, cultural understanding, nuclear proliferation and general question of war and peace. Turk Pipkin is the director of One Peace at a Time, an inspiring feature documentary highlighting solutions to some of the world’s most pressing problems. The film includes the insights of Nobel Peace laureate Muhammad Yunus, Nobel Physicist Steven Chu, (Barack Obama’s Secretary of Energy), Dr. Helene Gayle (CEO of CARE, International), American legend Willie Nelson and many others. Created by Les Amis du Village d’Amezray, a French association partnering with the project and financially supporting the roof and tower restoration slated for Spring 2010. 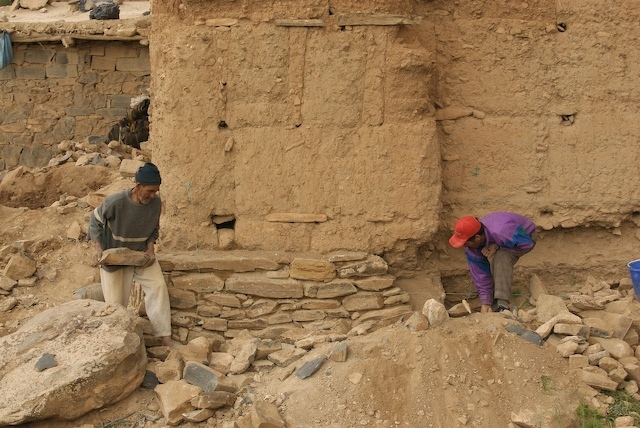 Project Director, Cloe Medina Erickson, recently returned from Morocco after two busy and productive months on the Igherm Restoration and Library Project. The highlights of the trip included a visit from Salima Naji, a Moroccan architect and anthropologist who specializes in rammed earth architecture and the restoration of ighermen (Moroccan fortified granaries). 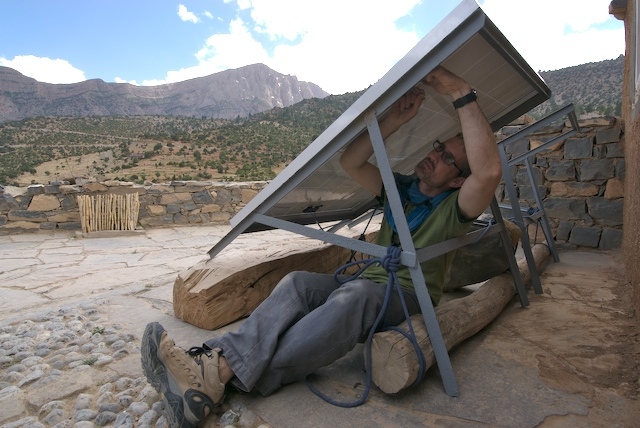 Cloe’s husband, Kristoffer Erickson, employed his knowledge of remote power systems gained as an expedition photographer and athlete for The North Face in the design and installation of the project’s solar electric system. The system was purchased with a $3000 grant from the TRA Fund, and will be used to power computers and cameras during the renovation phase until the opening of the library. At this time, it will be installed in its permanent role for lighting the book storage, reading/community room, and public computers. 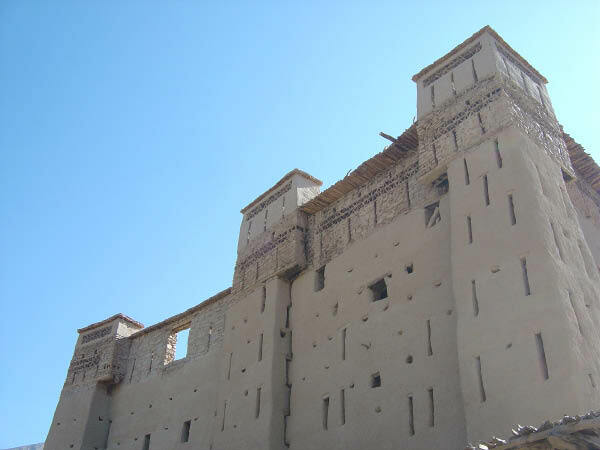 On May 27, two engineers from CERKAS, the Centre de Conservation et de Rehabilitation du Patrimoine Architectural des Zones Atlasiques et Subatlasiques, made the two day journey from their offices in Ouarzazate to visit the project. They performed a walkthrough providing advice on historically accurate structural rehabilitation methods and afterward gave their full approval of the project. Work will resume in September and include the completion of the façade renovation and the collection and purchase of materials in preparation for work in the spring. Renovation of the building’s two roofs and six towers is planned to begin in April of 2010. This phase is funded in part by a 2,000 euro donation from the French association, Les Amis de Amezrai, and its local partner association, Amezrai SMNID under the direction of Joel Talon and Youssef Oulcadi. Cloe Erickson (left) meets with Youssef Oulcadi (right) discussing the igherm. Fund raising efforts throughout this fall and winter will focus on raising another $2000 dollars needed for the roof and tower restoration as well as the funds needed, approximately $10,000, for the restoration of the interior of the building which will house the library. Tax deductible donations can be made here. 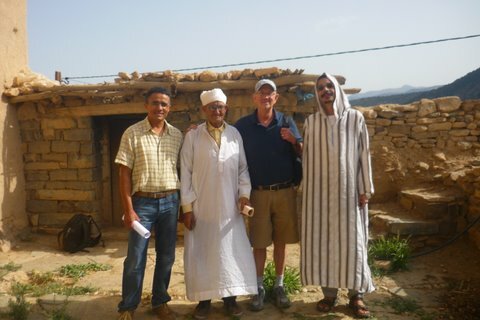 Throughout the winter local project manager Youssef Jini worked with the Amzrai tribe to install running water on site. The water comes from a spring in the near by foothills; use was granted to us by the owner of the spring for the lifetime of the library. The water is important because it is necessary for mixing the earth during renovation. In addition, the locals built an access road to the building. 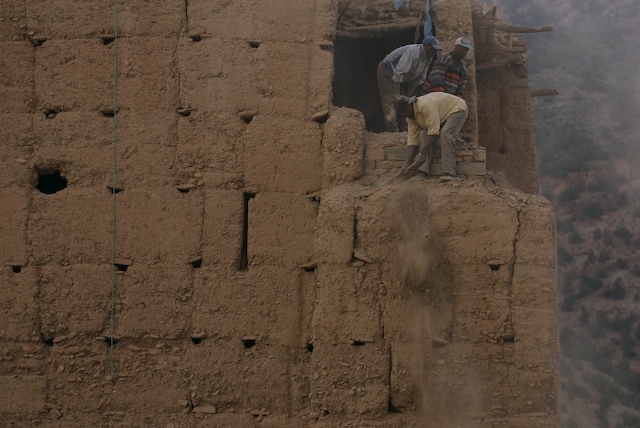 This road will allow for easy transportation of stone used in foundation repair and wood for the ceilings and floors. 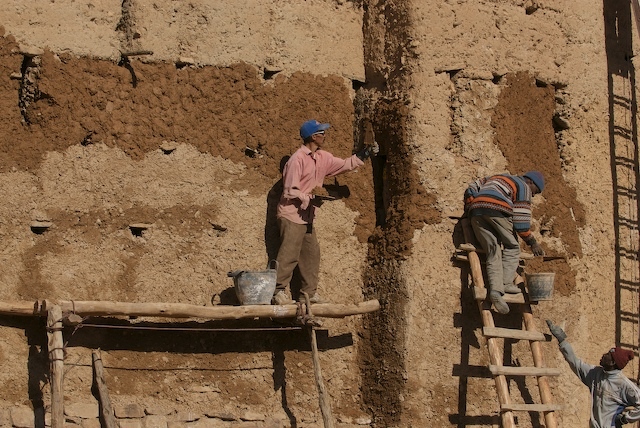 Project director, Cloe Medina Erickson, will arrive in Morocco April 28 and spend the next two months working on the beginning of the renovation. 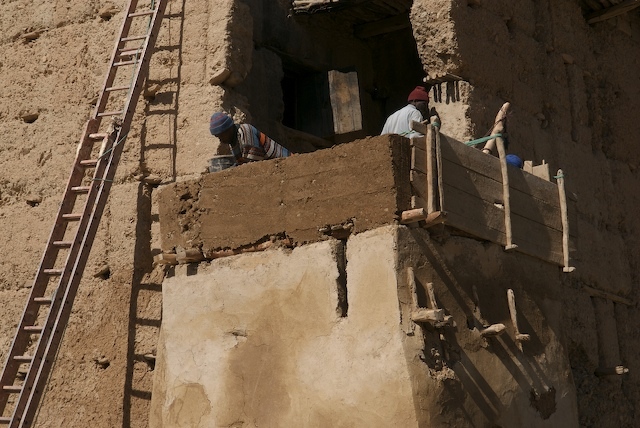 Seven American university students and two Moroccan students will work side by side with the locals for six weeks on the initial stages of the renovation. This program was made possible through a partnership with Montana State University. 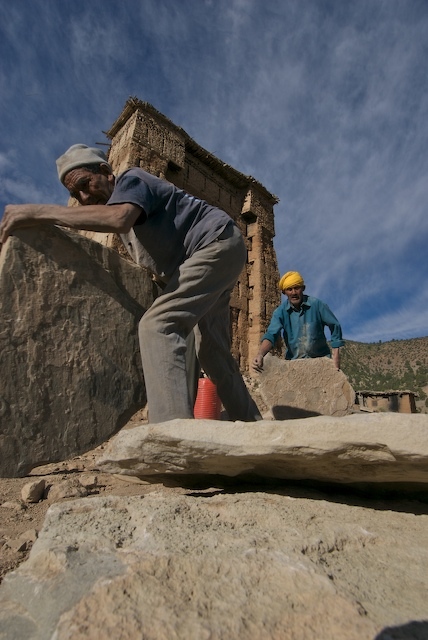 The team will work under the supervision of a master earth builder restorationist and master carpenter. The students will learn ancient earth building techniques. Photos of the restoration work will be posted in July.